You are here: Home › Further Reading › JFK Assassination FAQs › Did Marina Oswald Have Bad Teeth? Every important aspect of the JFK assassination, clearly explained and fully referenced. There are many unsolved mysteries in the JFK assassination. Although we now know a good deal about topics such as Lee Harvey Oswald’s interesting career and the alleged assassin’s impersonation in Mexico City, some of the most basic facts of the case are still unknown. For example, we do not know the exact nature of President Kennedy’s wounds, or even the number of shots that were fired. But one of the most curious mysteries is why so many people should be interested in the state of Marina Oswald’s teeth. The question has no obvious relevance to the JFK assassination, and ought not to interest anyone other than Marina Oswald herself, perhaps her close acquaintances, and presumably her dentist. Nevertheless, it is a question that some people seem to care about, so here is an overview of the evidence, followed by a brief account of Marina Oswald’s role in the investigation of the assassination. Marina Oswald was treated at Baylor University College of Dentistry on 8, 10 and 15 October 1962. According to one of the dentists who gave her treatment, “her teeth were in very poor condition. She had many cavities and needed much dental attention”. Three teeth were extracted. For the results of the FBI investigation into this important topic, see Commission Exhibit 1403 ( Warren Commission Hearings and Exhibits , vol.22, pp.770–772. The treatment was organised by members of the Russian émigré community in the Dallas area. George Bouhe describes paying for the treatment, and said that “she had a lot of teeth rotted to the roots” ( WCHE , vol.8, p.373). Marina Oswald was accompanied on her trips to the dentist by George and Jeanne de Mohrenschildt, who were given the job of supervising the Oswalds on their arrival in the United States before passing them on to Ruth Paine. In chapter two of his memoir, I’m a Patsy! I’m a Patsy! , George de Mohrenschildt mentions in passing Marina’s “bad teeth”. In chapter four, he mentions the dental treatment at Baylor, and claims that four teeth were extracted. It is not unlikely that Marina Porter, as she became in 1965, has visited the dentist in the five decades since the JFK assassination. She may have had further treatment, perhaps including fillings, and possibly extractions. She may even have had her teeth cleaned. Scandalously, records of any treatment since 1962 do not appear to have been placed in the public domain. Over the years, researchers have made use of the Freedom of Information Act to release many important documents, such as the results of the neutron activation analysis of Lee Oswald’s paraffin casts. Those interested in the state of President Kennedy’s alleged assassin’s wife’s teeth should use the might of the Act to set this essential information free. Why the Interest in Marina Oswald’s Teeth? Much of the interest in the state of Marina Oswald’s teeth comes from readers of a book which claims, among other things, that Marina “is reluctant to smile because of her bad teeth”. The book, which apparently argues that Lee Harvey Oswald was guilty of the JFK assassination, is Killing Kennedy by Bill O’Reilly and Martin Dugard. For the benefit of non–US readers: Bill O’Reilly is a presenter on Fox News, a comically right–wing television station whose ideological function seems to be to make the rest of the US corporate media appear credible and impartial. The National Geographic channel, which, like Fox News, is a member of the Rupert Murdoch business empire, has made a dramatised version of the book. Edward Curtin at Dissident Voice. Jim DiEugenio at Consortium News. 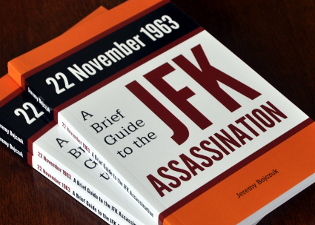 This website includes a list of JFK assassination books, almost all of which are more credible than Killing Kennedy . Bill O’Reilly and Martin Dugard were not the first writers to publish a book under this title. In 1995, the prolific author Harrison Livingstone released Killing Kennedy and the Hoax of the Century , which takes pot shots at the easy target of Gerald Posner’s Case Closed , as well as claiming that the Zapruder film is a fake. She claimed that Lee Oswald had practised firing a rifle before the assassination. She claimed that Lee Oswald had attempted to assassinate General Edwin Walker several months before the killing of President Kennedy. She claimed that Lee Oswald had intended to assassinate Richard Nixon on a visit to Dallas early in 1963. The unreliability of Marina Oswald’s testimony was recognised by the Warren Commission. In a memo to the Commission’s General Counsel, J. Lee Rankin, one of the Commission’s attorneys, Norman Redlich, wrote that “neither you nor I have any desire to smear the reputation of any individual. We cannot ignore, however, that Marina Oswald has repeatedly lied to the [Secret] Service, the FBI, and this Commission on matters which are of vital concern to the people of this country and the world” ( HSCA Report , Appendix vol.11, p.126). According to CE 325 ( WCHE , vol.16, p.917), Marina Oswald may have received $132,350 during this period by selling the rights to her story to various media outlets. The more inventive conspiracy theorists have speculated that some of this largesse was an indirect reward for incriminating Lee Oswald. As an indication of what $132,350 was worth in the early 1960s, Lee Harvey Oswald’s $1.25–an–hour job at the Texas School Book Depository would have earned him roughly $3,000 per year. How Accurate is Oliver Stone’s Movie, JFK ? Did Lee Harvey Oswald Try to Kill Richard Nixon?